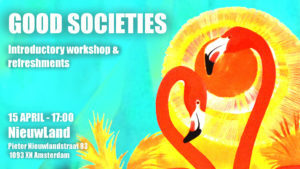 Good Societies is a new project I’m organising in Amsterdam with my friend and colleague Doro Wiese. It offers a space to come together to reflect on what a ‘good’ society might look like. We think that, in an age of economic, political and ecological turmoil, it’s more important than ever to open our imaginations and formulate real alternatives to our current social arrangements. Meeting in the autonomous space NieuwLand, the project consists of regular workshops and a reading group combining non-fiction and fiction. We tackle questions like: what economic models would a good society have? What political systems? What would gender look like in a good society? Would we have nation-states? What would ‘good’ globalisation look like?